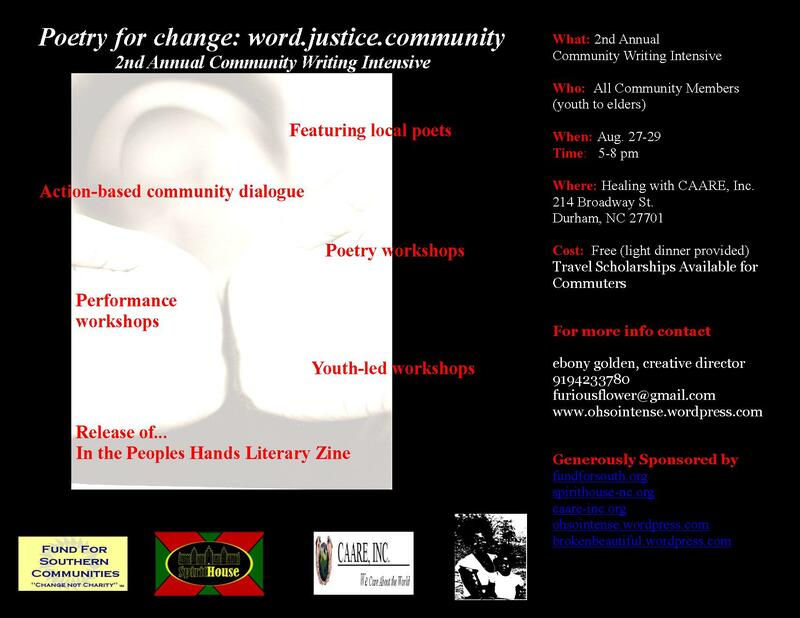 Community Writing Intensive, Activating Poetic Roots~~ | Poetry in, by and for Community!!! Durham, NC—Aug. 27-29 artists from North Carolina, Tennessee, and New York will gather for the second annual Community Writing Intensive in Durham, NC at the Healing with CAARE facilities located at 214 Broadway. The motto of this year’s Intensive is “Poetry for change: word.justice.community” and will focus on using poetry as a tool for actualizing justice in local communities. 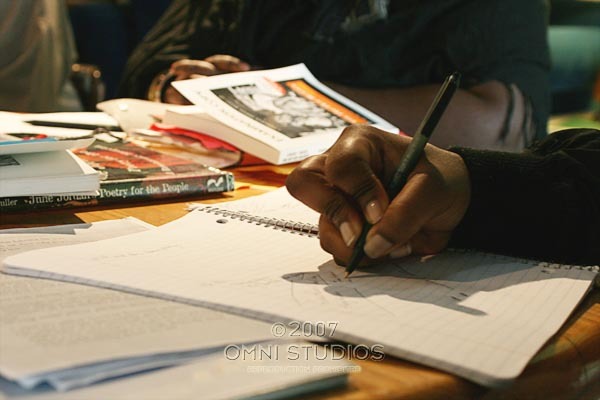 The Community Writing Intensive is sponsored by Funds for Southern Communities, Healing with CAARE, Inc., betty’s daughter arts collaborative, SpiritHouse-NC and BrokenBeautiful Press. 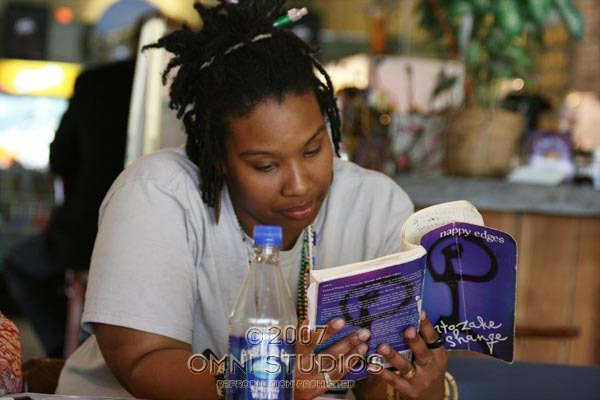 For more information about the intensive, to apply or to donate time, money, or services contact inthepeopleshands@gmail.com or call Ebony Golden at 9194233780.
above: Monica Daye meditating on some Ntozake Shange. Oh so necessary!! Community Writing intensive a success! Although we have completed the first annual Community Writing Intensive, you can stay involved in the activities and initiatives of our sponsors. Do not hesitate to email inthepeopleshands@gmail.com to offer a donation, share opportunities for networking or, to join our virtual community and to get involved. Below you will find writings created by members of the Annual Community Writing Intensive held in Durham, NC. Those sistas and brothas who participated graciously shared their time, critique, and love over a three day period and here is just a taste of what we learned together. I would like to personally thank all those who participated, and sent their well wishes as Broken Beautiful Press, Betty’s Daughter Arts Collaborative, and SpiritHouse-NC continue to create and share arts programming all over this planet. Please check back for more poems and ways to get involved with grassroots literary organizing. 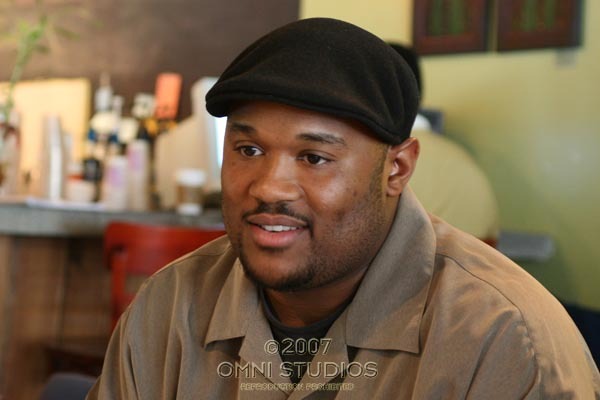 Betty’s Daughter Arts Collaborative, Broken Beautiful Press, and SpiritHouse-NC are proud to annouce the winner of the Betty A. Sims, Ed.D Artist/Scholar Travel Scholarship, Mr. D. Noble of Greensboro, NC. D. Noble is a grassroots community artist informed and inspired by the angst and passions of the people. He believes in functional Black art that can be wielded into a tangible weapon empowering the people to strike back against the stifling forces of oppression. Full of intelligence, strength, and determination. I show gratitude for helping shape my identity. above: if these fingers could write the ancestors, what would they write? 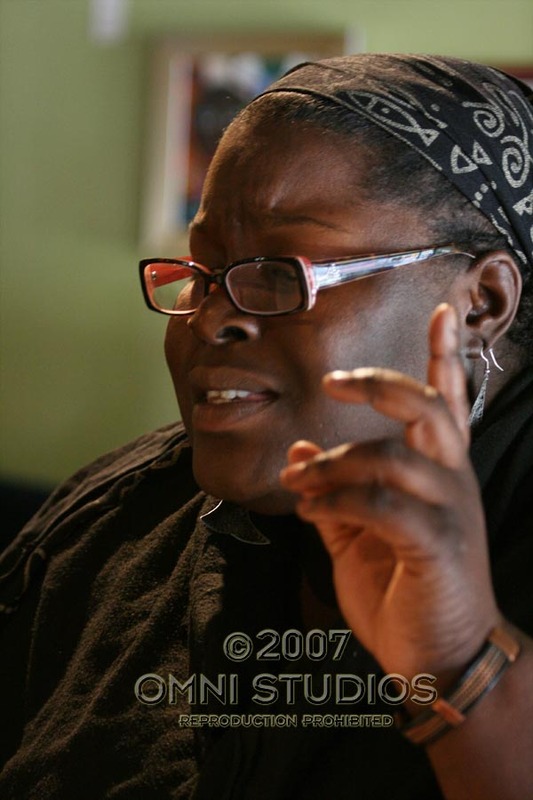 Above: Mama Nia drops knowledge how it should be dropped.